DontCrack is proud to introduce MAGMA, a REVOLUTIONARY plug-in application that will change the way you use plug-ins! MAGMA version 1.6.2 adds two significant new modules. The first is a Modulation Matrix with up to 32 source/destination routings, 8 programmable LFOs, and a programmable 16-step sophisticated MSEG Multiple Segment Envelope Generator that allows users to create up to 8 unique envelopes for modulation sources. All sources, including MIDI messages, can control any parameter of any MAGMA effect loaded in the virtual rack. The second new module is called the VST Chainer, which allows users to load and access all other Nomad Factory plug-ins or any 3rd party VST plug-ins for use in the MAGMA routing and processing environment. 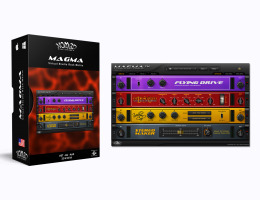 Both of these modules are offered as a no-cost upgrade version 1.0 of MAGMA that already features new types of audio processing, routing, and flexibility in a simple, intuitive package. You can quickly build great effects chains for vocals, guitars, synths, etc. using just one insert in your signal path. Place effects in where you need them, simply drag and drop them to assemble the optimal signal chain you want, change the order around until you hear what you really want. MAGMA actually ships with 65 different professional plug-ins to construct your sound that will get you the results you want without ever fiddling with wrappers to "trick" your host audio engine into accepting them. This is a new concept, a new type of "Patch Bay" unlimited in its ability to build quickly the sounds you need, and later be recalled at will. You will be able to mix and match effects, create and recall unique chains, and process your audio in ways that were previously unimaginable. MAGMA allows users to chain an infinite number of effects within a single plugin. MAGMA will shortly load third party VSTs and even Wave Shell plug-ins within four easy to use racks that allows the user to load an infinite combination of effect chains that can be saved and then loaded in any sequencer host application. That clearly opens new perspective on how plug-ins can be used in studio or live environments. MAGMA offers the ability to drag & drop racks freely within a flexible routing matrix that allows users to build the effect chains as they've never done before. All for a price that defies belief. AAX, RTAS, AU and VST plug-ins. Download the demo and take MAGMA out for a test drive, and let your creativity burn up the track!